So, as a ‘cheerio‘ to summer and a ‘hello‘ to autumn, I’ve tried to encapsulate both seasons in this cupcake. As you can see it’s a take on the summery ’99’ ice-cream with blackberries; a hedgerow fruit which grows in abundance and can be easily picked at this time of year. A fond farewell summer, it’s been nice to have had you around. Cheerio until next year, mon ami. Welcome autumn, I’m so looking forward to kicking up the golden leaves as they fall from the trees whilst you’re around. And celebrating so many family birthdays including Mr E’s and my own! Hurrah! 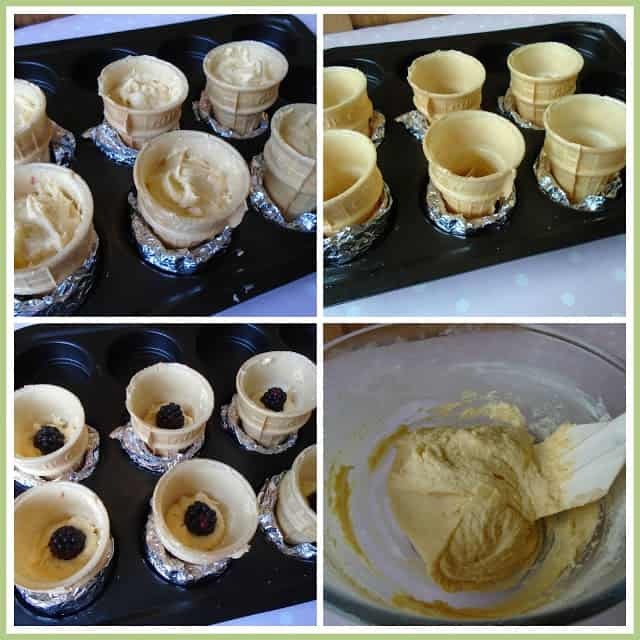 I’ve been wanting to try my hand at making these quirky cupcakes for a while now having seen them on Pinterest and the likes, so having some blackberries in the house waiting to be used, I weighed my sponge ingredients and baked these scrummy beauties. The sponge is a basic Victoria mixture, with a blackberry nestled in the centre, being housed in a flat bottomed wafer ice-cream cone. I did worry slightly that the wafer would spoil by going into the oven but I can confirm that they came out fine. The top of the cupcake is loosely iced with frosting to mimic the ice-cream. 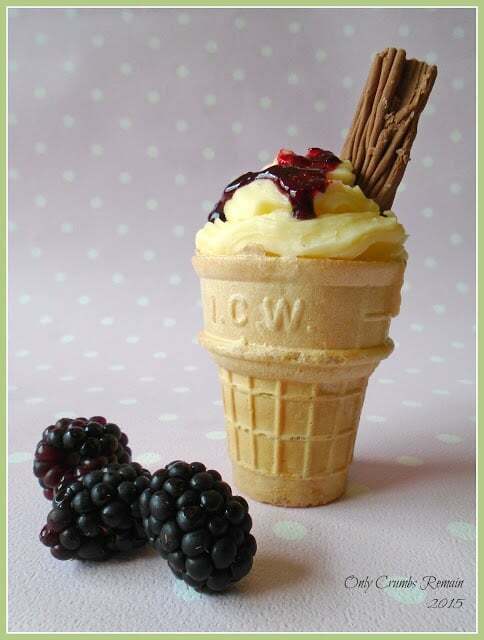 The cupcake is then completed with a flake and a drizzle of blackberry sauce! Mmm yum! These bakes are a delight to look at and eat. Not only are they a little different to the usual paper based cupcakes, but they taste pretty good too. The blackberries cut through the sweet frosting beautifully and the chocolate flake adds an extra treat. They’d be great for a party at anytime of year. 1. Pre heat the oven to 190c / Fan 170 / Gas 5. 2. Prepare the wafer cones. Cut nine narrow strips of tin foil, scrunch up to make donut ring shapes to sit in the muffin tin. Knock off any excess wafer from the cones, especially from the bases as this will help them stand upright. Sit the wafer cupcakes in the foil donut rings. 3. Make the sponge batter. Place the butter in a large bowl and beat either with a wooden spoon or hand held electric beater or stand mixer. Add the sugar and beat well until pale and fluffy. Add the beaten eggs a little at a time, beating well after each addition. If the mixture looks like it may curdle, add a dessert spoon of the weighed flour and mix to combine. Add the vanilla and milk and mix again. Gently fold in the sieved flour with a large metal spoon or spatula. 4. Fill the wafer cases. Using a teaspoon (or piping bag if you prefer) place a small amount of the sponge batter into the base of each of the wafer cases (no more than 1 teaspoon). Ease the mixture down. Place a small blackberry in the centre of the sponge batter and top with a further teaspoon of the batter. Tease the batter down the sides of the blackberry, smooth the top. Avoid over filling the cases. You’re aiming for the cases to be half to two thirds full. (On the images above, I filled our cones to just beneath the base of the lettering on the cone). 5. Bake the cupcakes. Place the muffin tray in the pre-heated oven and bake for about 20 minutes. You may need to rotate the tray after about 15 minutes. Remove from the oven once a skewer inserted into the cupcake comes out clean. Place on a cooling rack to cool. 6. Make the blackberry sauce. While the cupcakes are baking make the sauce. Place the blackberries into a small pan with the icing sugar and the water. Place over a medium heat and allow to cook. Stir regularly with a wooden spoon, breaking up the blackberries. Once the mixture has thickened a little, remove from the heat and place into a bowl to cool. Once cool you may want to sieve the mixture to remove any seeds. 7. Make the frosting. Place the butter into a good sized bowl and beat with the electric beater to ensure it is soft. Add the sieved icing sugar and slowly mix to combine with a wooden spoon. Add the full fat cream cheese and beat again with the electric beater for 2-3 minutes until it is well combined and creamy. 8. Pipe the frosting. Place the frosting in a piping bag fitted with a large star nozzle. Make a generous swirl of frosting on the top of each cupcake. 9. Finish the decoration. Insert a flake into the top of the cupcake and drizzle with the blackberry sauce. Ha-ha-ha, thank you Stuart. I think the ice-cream impression helps with the very loose piping of the frosting. Thank you 🙂 We enjoyed the fruit with them, it just broke up the richness of the frosting as well as giving another flavour dimension. They're so much fun aren't they. I expect they went down a treat at your school fair. So yummy and fun! Thanks for stopping by and sharing with us at #TryaBiteTuesday – pinned and shared your delicious treat! Hope to see you back next week, thanks again! I think I've managed to pick just enough blackberries to be able to give this a go, they look fab! 🙂 thank you x I'm off blackberry picking very soon….more blackberry recipes to come (purple fingers crossed)! If you do give them a go, try not to over fill them. 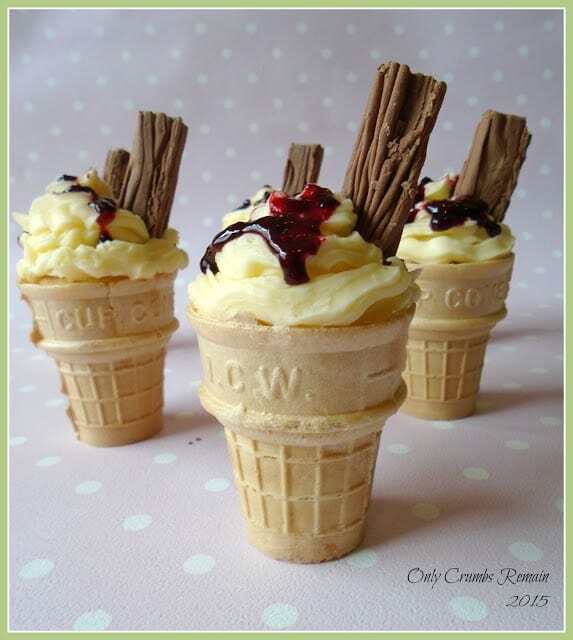 The ice cream cones are really quite deceptive and it's easy to put too much batter mixture in resulting in the mixture over flowing as it bakes. I'd aim to fill it to beneath the lettering on the cone (if that makes sense). These are great! If I was crazy enough I would make them for my son's class! Thank you for sharing this fab recipe with #foodpornthursdays. I used to love blackberry picking at my Granny's when I was little. Sadly I haven't spotted any stray bushes near me, I'm going to have to keep an eye out as they're one of my favourite fruits. These cupcakes are so much fun and they sound delicious. Ooh they're a scrummy fruit aren't they, and so easy to pick yourself (when you find a blackberry bush that is). I must say until last yr I'd not seen many for a number of years also, but since Mr E & I have been taking a regular walk at a local nature reserve we've found many bushes there. We seem to be finding them along canal tow paths, some river banks too and simply off the beaten track. I'm hoping to pick some this next week, as they're not quite ripe here in Yorkshire at the moment. Hope you manage to find some. Ha-ha-ha 🙂 I'm so glad they fooled somebody – that's the aim (well not to fool you, but you know what I mean I hope). Thanks so much Lucy, and you're welcome.